Dkuhn has attached this picture to aid in identification. The message is below. Posts: 2 Could anyone help with the identification of this insect as to genus and hopefully species. Common name would be great too. I believe your caddisfly to be of genus Phryganea, probably P. sayi, but you also have P. cinerea in Maine. In either case, the common name would be Rush Sedge. Posts: 2 Thanks for the information Roger. Posts: 51 Sure does look like a phryganea or agrypnia but I wonder about the scalloped wings... i've not seen them but there are some limnephilids up y'alls way that have this character. good looking bug. is hesperophylax around those parts? The Limnephilid with the scalloped wings is Nemotaulius hostilis. 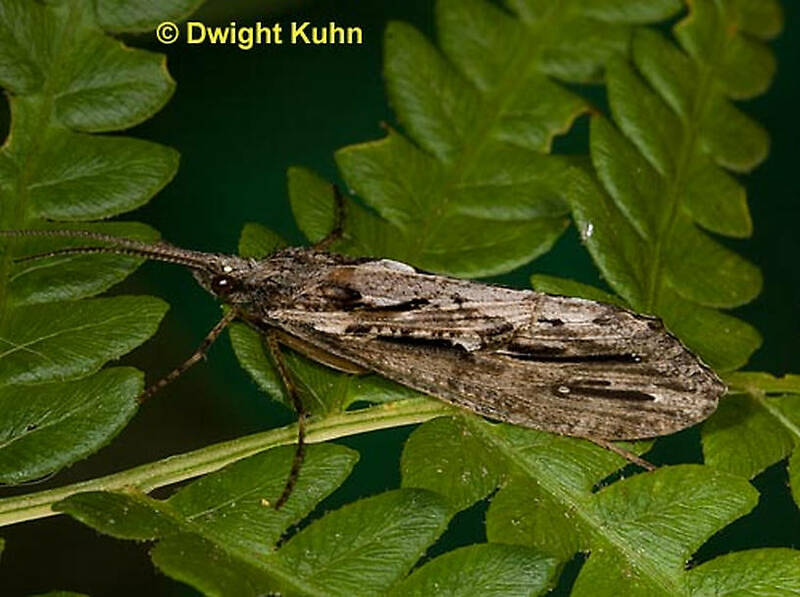 However, their wing scalloping is much more exaggerated, and their wing patterning is quite different from Dwight's caddisfly. Am a bit surprised that you haven't weighed in on this one. Do you think I'm wrong in my belief that Dwight's caddisfly is Phryganea? Posts: 282 folks - it has been awhile since I looked at this forum. I would agree this is Phryganea, and perhaps sayi, although it would take a look at the private parts to be really sure. If you have a view of the apex of the hind wing it may help as most P.sayi have a darkened wing apex. Wiggins' phyganeid monograph provides photos of several Phryganea and the wings look pretty similar. given the thread above I don't see the indication that this critter came from Maine. What did I miss? While my stuff is all in ETOH where color patterns are usually reduced/lost, the wings of Agrypnia are usually more mottled and I think they all lack the black slashes/stripes in the forewings. In addition to Nemotaulius, some of the western Neophylax have the scalloped forewing apex. And Hesperophylax has a very distinct silver forewing strip. There was no indication in the thread that either the critter or its photographer was from Maine. So, I googled Dwight Kuhn photography, discovered Dwight resides in Dexter, Maine, and made an assumption that he had probably taken the photo in-state. When offering an id opinion based on a single photo and little other information, it is generally necessary to employ to some rather extreme strategies, which rarely involve use of dichotomous keys. P. cinerea seems to be far more widely distributed and collected in Maine than P. sayi. What was your reason for suggesting sayi as the probable species? As I recall, it was the several weeks later emergence of P. sayi, which make it somewhat more likely to still be around. Posts: 282 Photo submitted in September means it was taken is September? I guess that is another one of those assumptions taken to place a species name on a photo. Keys are made by folks who don't need them for folks who cannot understand them. Having tried to make several fairly complex keys over the years, I totally understand the utter frustration of trying to simply state a truly complex distinction. The last couplets are the easiest and they get much tougher as you go toward the front of the key. Until the NA authors convert to the tabular approach they are a necessary evil for the inexperienced. But, they will always remain a treasure trove of valuable information for the experienced.